Values steer your motivation. What you value is what you believe is important and hence it’s what steers your thoughts and behaviours. Knowing your values is an important Personal Development Insight and hence the reason why we’re offering this FREE Values Worksheet for Adults. Identifying Personal Values. Values permeate all aspect of your life. You have so many of them including: Individual values, Work Values, Money Values, Relationship Values, Family Values, Cultural Values, and so on. Your personal values motivate you towards a certain mission in life, and when you identify them you become more clear with what your life’s purpose is. Then you can choose work, hobbies, or any part of your daily routine to support your values. Values can range from family traditions, to more everyday values in work situations such as punctuality and reliability, and then there are personal values that are psychological such as self-respect, kindness towards others and having a life purpose. Everyone has their own unique personal values that guide them. You can see this in action when we consider successful people who are driven by their values and beliefs. For instance, someone whose value is to make a difference in people’s lives would be drawn to becoming a counsellor or teacher. Another person who might have values about children’s rights becomes successful in a career of social work. On the other hand, if a person has strong family values, but works a 60 hour work week it is likely they will feel a lot of pressure and stress. Hence, identifying personal values is an important personal development technique for self-improvement and self-help. If your life focus is different than your core values you will feel dissatisfied and frustrated. It’s important to ensure that your values determine your priorities. When you do things that aligned with your personal values you’re feeling content and satisfied. It’s much easier to make decisions once you’ve identified your values. Life goes much more smoothly. In this value worksheet for adults, a free personal development worksheet, you’ll become more deeply familiar with your values. Put some time aside for identifying values and listing them in order of importance. For instance, if you believe that family is of utmost importance then rank that value as #1, and so on. You might like to circle the values that first stand out for you as important and then list those main ones from 1 to 10 as #1 being your top value. Sometimes you’ll find that a few values nearly rank the same – and that’s ok. Remember, everyone has different values and ideas of what’s most important to them. No one is wrong. Everyone is different. The idea is to first identify your values and then determine how they play a role in your life. Do your daily activities support what you value? 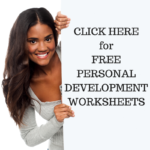 Download the FREE PERSONAL DEVELOPMENT WORKSHEET, value worksheet for adults, by clicking here. This entry was posted in Free Personal Development Worksheets, Personal Development Resources and tagged identifying personal values, identifying values, identifying values worksheet, personal values, self help, self improvement, value worksheets for adults. Bookmark the permalink. Next Post: What’s in Your Personal Development Toolbox?